R. Kelly was slated to play a show at the University of Illinois at Chicago in his hometown this weekend, but activists and UIC staff managed to get his performance pulled as a part of the #MuteRKelly campaign. 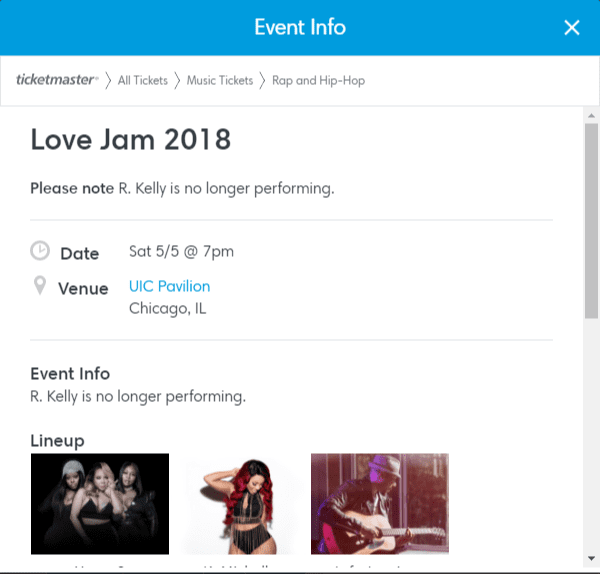 According to the Ticketmaster website, Kelly is “no longer performing” at the 2018 Love Jam concert this weekend. The Chicago Tribune reports that Kelly’s management team says the concert is still on, stating in an email attributed to his management team that “We have received no official notice of any changes in plans for the May 5 concert, and R. Kelly has been looking forward to performing for his fans in his hometown.” Additionally, university officials directed reporters to the chancellor’s office to respond to comments, but he declined. Over the past 24 years, Kelly has been accused of sexual misconduct numerous times. Vox outlined all of his accusations, starting with the marriage to a 15-year-old girl in 1994 all the way up to earlier this month, where he was accused for “knowingly and intentionally infecting” a woman with an STD. Despite the backlash from the media, Kelly has continued to tour. However, social justice activist Kenyette “Tish” Barnes, who co-founded the #MuteRKelly movement, has been working to shut down multiple Kelly concerts. So far, the campaign has helped cancel 10 of his shows, including the one at UIC, and even managed to get Tom Joyner to ban Kelly’s music from his morning radio show. Last week, Kelly’s publicist, lawyer and assistant resigned. Kelly has not made any statements on the cancellation.